If you are planning a church wedding then you are thinking about church pew wedding decorations that will match your colors and/or theme. 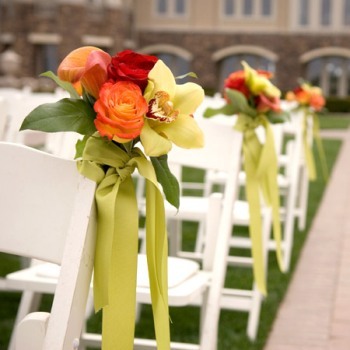 You have come to the right place for some nice ideas you can incorporate into your theme and/or colors for the wedding. While a big shiny bow fixed to the end of the pew would do very well in the past this is not so true with today's more adventuresome couples. These decorations now are more creative, colorful and reflect the personalities of the bride and groom and they can be casual, whimsical or simply elegant. It is also the first introduction to the guest of what your day will be as to color and theme. Read on to see other great ideas for your pew decorations!!! Bows are certainly still popular and range from lovely rich velvets to a hand-tied raffia bow or whatever you like in-between. Flowers, on the other hand, have taken on a whole new look and don't be surprised to see everything from small wreaths to flower balls hung with theme colored ribbon to wedding bouquets in small galvanized buckets. There are clip-on holders that can hold a basket, bucket or cone arrangements of blooms. You can also combine flowers and bows if you wish by hanging a small wreath below a bow that has long ribbon streamers. Tulle may be purchased by the yard in many colors and is easy to work with. 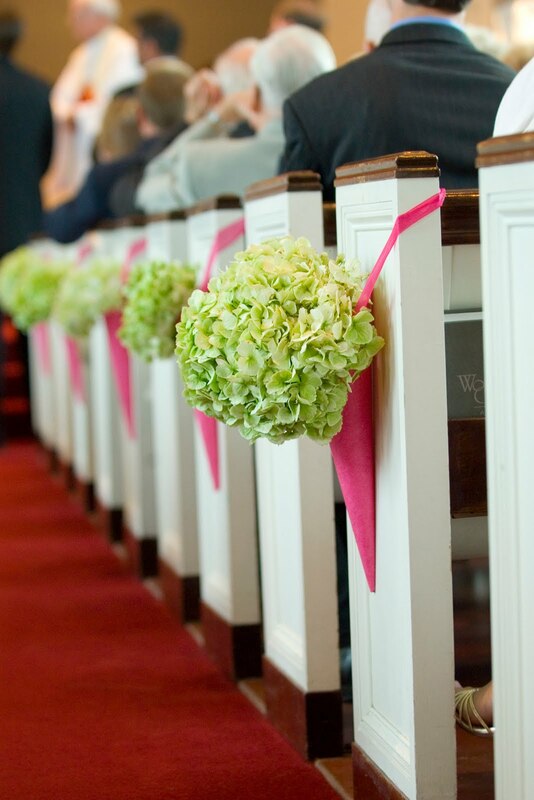 Do a puffy large bow attached to each pew and swag it from row to row. Finish it be tucking some small flowers in each bow. Make a large bow and tuck things that fit your wedding theme throughout the bow. Feathers are quite popular now and they can be beautifully stunning when attached with ribbon or silk scarfs: depending upon the feathers and the ribbons or scarfs this is perfect for contemporary or elegant weddings. For Christmas or winter weddings, tuck small ornaments into tulle bows and try to pick those that fit your personal theme. Pom Pom decorations of paper or fabric in your colors is inexpensive and easy for an informal wedding and use gold, silver or white for a formal wedding. I really like these because they are different and truly catch your eye. 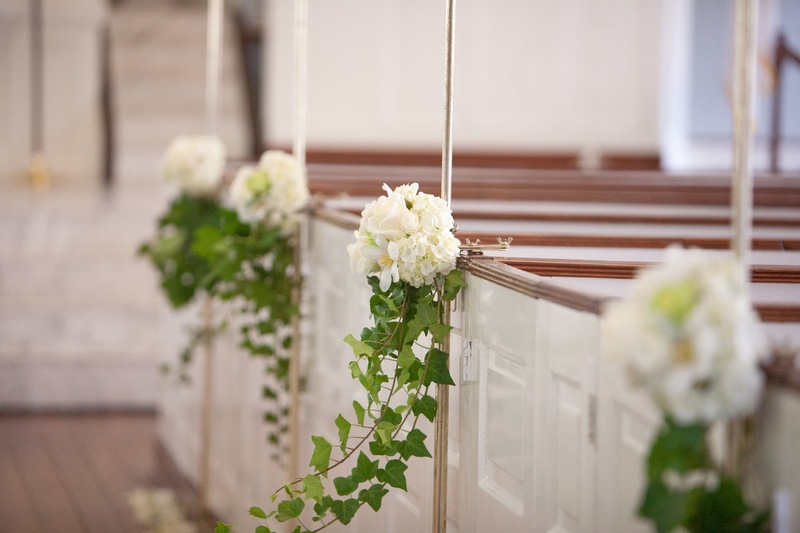 You can buy or rent wedding pew clips that will not damage the pews and you can hang whatever you wish from them. Shepherd's hooks with stands can be rented and used indoors or outdoors for hanging your pew decorations. Incorporate your wedding theme and colors into your design as this gives your guests a lovely look at the theme that will be carried out for the balance of the day. There are truly so many things you can do to make the aisle you walk down very special for you and your special day. Some cautions for you however, and one is that depending on your church and your religious background you may be restricted about what you can do to decorate the church sanctuary. To save stress and such, always check out the design of what you wish to do and get approval from the church before purchasing anything. Another caution is to be careful you don't make it difficult for guests to get to their seats or block the aisle so it's hard for people to walk down. May your day be just as you dream it to be with family and friends watching you take each step down the aisle passing each church pew wedding decoration you lovingly planned.